A young camper once asked me a really sophisticated question about whether a coast redwood could burn from the inside without spreading through the forest or killing the tree. It made me wonder if there are ever times when I oversimplify concepts in an effort to meet campers at their level—or what I think is their level. The truth is that they consistently surprise me with their capacity for complex knowledge, not because they immediately take it in and file it away in their brain bank, but because they will often go to any length to understand it. They’ll keep asking questions, they’ll get their hands dirty, and when all else fails, their imaginations take over to work through concepts in unprecedented ways. I love seeing them get involved in scavenger hunts at camp because it’s the perfect invitation for them to take the initiative in their own learning, and they commit with vigor when we hand it over for them to take the reins. It’s the kind of thing that kids would benefit from year round—not just as a way to keep up with their critical thinking and exploration skills, but also as a way to stay connected with the natural ecosystems that thrive around them. 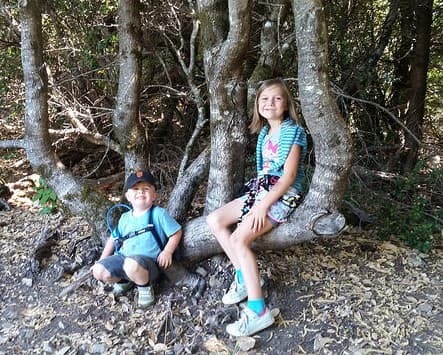 I have a favorite hike to take with kids: the Loma Prieta Grade Trail in Nisene Marks State Park. Not only is it a remarkable display of our natural landscape’s resilience, but it’s also a window into some of our local history (if you have a sharp eye and a knack for asking questions). This weekend, I took a walk and looked for challenges and points of interest that would be perfect for kids’ enthusiastic curiosity. I’ve put together some of the most interesting, and I hope you’ll find them useful if you decide to continue the scavenger hunt tradition outside of camp. 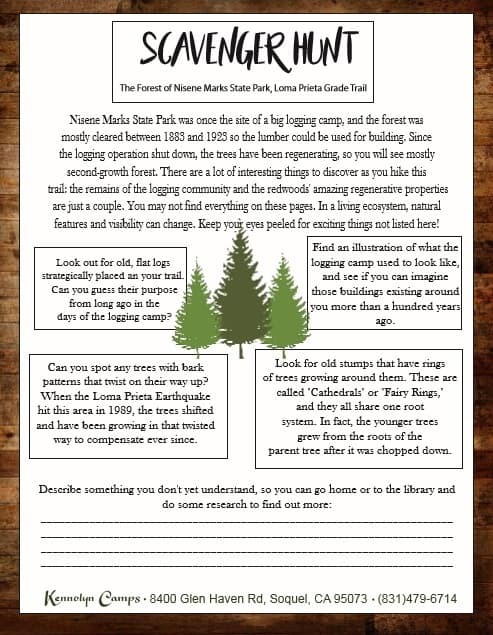 Print out enough of these pages for each of your kids, and be sure to print one out for yourself, too—it’s a great way for you to connect with them and the adventures they have away from home at summer camp. For an extra challenge, add a point system: perhaps five points for finding a tree affected by the Loma Prieta quake, and two for tracking a banana slug down. Then put on your hiking boots and prepare to be amazed by the incredible ways your children relate to the world. Kids have a blast with our scavenger hunts here at Kennolyn. Sometimes they’re learning more about marine ecosystems in a hands-on way, and sometimes they’re searching for costumed counselors in the woods. Regardless, they’re always opening their eyes and engaging with their imaginations to discover more. Get in touch with us to learn about the wide range of activities and adventures we offer kids who come to Kennolyn.